Last week the 9th Circuit Court of Appeals granted the US Chamber of Commerce a temporary injunction of the city’s ordinance granting Uber drivers the right to collective bargaining. Today it made that injunction permanent pending the court’s final ruling on the merits of the appeal. At the beginning of August, a US District Court judge ruled for the city, dismissing the Chamber of Commerce’s case and refusing to grant a stay of that ruling pending appeal. As the deadline approached for Uber to hand over a list of its drivers to the Teamsters as per the ordinance, the Chamber filed its appeal to the 9th Circuit and asked for an emergency injunction. The appeals court granted an emergency stay just before the deadline to give it time to consider legal briefs from both sides. Those briefs were filed earlier this week (the City of Seattle on Tuesday, and the Chamber yesterday). The briefs from both sides are mostly rehashes of their arguments at the district court level, with the exception of one new matter: which standard to use for deciding whether to grant an injunction. The nationwide standard is a four-part test, in which the petitioner must show that they are likely to win the case on the merits, that they will suffer irreparable harm otherwise, that the balance of harms tips in their favor, and that an injunction is in the public interest. But the 9th Circuit has established an alternate test, under which the petitioner needs to raise “serious questions” of law rather than showing that they are likely to succeed on the merits. The Chamber argues that this second test (a lower bar) should be used; the City of Seattle argues for the first. The 9th Circuit ruled quickly, and in the Chamber’s favor. Curiously, it did not provide any details as to how it came to its decision, other than citing a case that uses the first test, the one requiring a showing that the petitioner is likely to succeed on the merits — implying that the Chamber met the higher bar. This is all a bit strange, given that it has an emergency stay already in place and could have taken its time considering the issues and writing an explanation in its order. And I’m sure both sides would have appreciated it if the Court had tipped its hand as to which issues it considered most important to brief — which of the Chamber’s several arguments was likely to succeed on the merits. Perhaps, given the weighty and relevant issues in the case, the appeals court was simply looking for a chance to weigh in and set a broader precedent. But if the 9th Circuit believes the Chamber is likely to succeed on the merits, that’s a very bad omen for the City of Seattle. 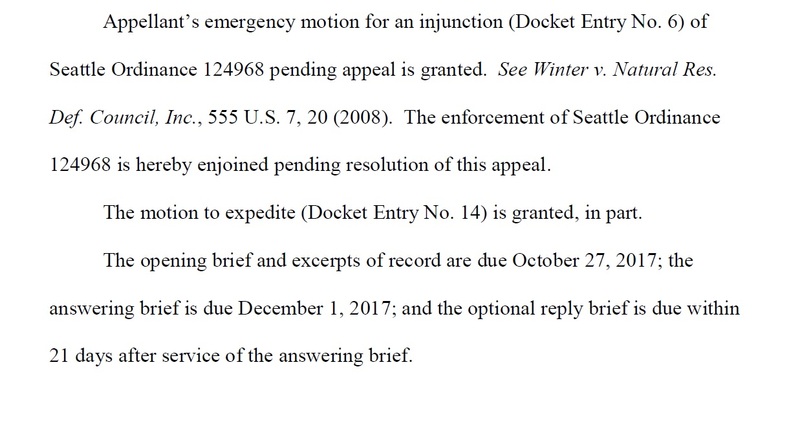 The court did, however, grant an expedited schedule for hearing the appeal now that it has shifted from debating an injunction to the merits of the case. The Chamber will file its opening brief by October 27; the City of Seattle will file its response by December 1, and the Chamber will file its reply by December 22. Again, given the national importance of the issues being raised, it’s fair to assume there will be oral arguments, but they have not yet been scheduled. Suffice it to say the Uber union ordinance won’t be moving forward until mid-2018 at the earliest.